This summer I am housesitting for a good friend in Vancouver. In the process, I have been adjusting to life in Vancouver and to a different kitchen. I didn’t bring my appliances, cookbooks or usual equipment, which I always keep on hand at home. In some ways, this change is a good challenge, because it compels me to be more creative: I have to work with the tools and resources that I have here. The interior of my friend’s place is beautiful, and his garden is truly amazing. 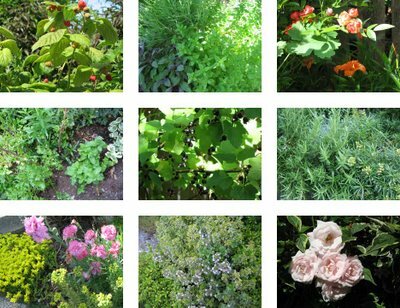 For instance, the garden’s assortment of herbs includes: lavender, sage, rosemary, tarragon, oregano, mint, cilantro, parsley, chives, thyme, lemon thyme, creeping thyme, and others I haven’t identified yet. He also has raspberry and black current bushes. There are many plants in various stages of growth that will offer tomatoes, zucchini, leafy greens and things that will surely be a pleasant surprise. My friend has also planted a beautiful assortment of flowers. In short, the garden looks fantastic, and I feel very fortunate to be staying here. Thanks so much, P.! With such a fabulous array of herbs, berries, vegetables and flowers, I will certainly be drawing from this wonderful garden in my baking and in my posts. Cheers! Posted by Sam at 2:51 a.m.
lovely pics, Sam. How lucky for you to be house sitting for someone with such a gorgeous garden! I'm totally jealous! I can't wait to see what creative things you come up with in such an inspirational setting! I feel very lucky. The garden is very beautiful and inspirational. Here is to a fantatsic summer for everybody. Cheers!